After Moonrise consists of two short stories by two great authors. 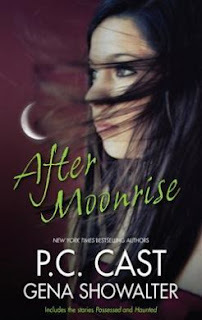 This combination makes After Moorise a must read for any paranormal romance fan. It would also be a great starting point for anyone new to the genre. Possessed is a fast paced story, making it perfect for a quick read. Enjoyable although perhaps a little predictable, with an unusual and unique ending Possessed is easy to read. Overall a well written tale. I have not read a lot of Gena Showalter, but what I have read certainly does not disappoint, and this story is no exception. Mysterious and raunchy Haunted was a delight to read and I found myself savoring every paragraph. Full of twists and intrigue, Haunted was a great read.